The Trinity News legal analysis of our Knights' hazing story is incomplete, writes Prof Eoin O’Dell. Reporters from The University Times observed an initiation evening held by the Knights of the Campanile on February 27th, 2019. It is a truth universally acknowledged that, where there are two lawyers, there will be at least three legal opinions. In the same way that there are two sides to every story, there are two legal arguments in every case. And where there are matters of public controversy, there can be at least as many legal views on them as there are lawyers commenting about them. In College at present, there is a controversy over the means by which this newspaper obtained information that it recently published in an article alleging that the Knights of the Campanile were implicated in an on-campus hazing evening. In an op-ed in Trinity News, three of my Law School colleagues yesterday offered an opinion about one of the legal issues in that controversy. And on that issue, I think that there is more to be said about it. I have advised this newspaper about that issue. In the past, I’ve advised Trinity News, this newspaper, and many other publications in College about a wide range of legal issues – and I’m sure I will do so again in the future. The op-ed concerns the extent to which the Cogley vs RTÉ case can be relied on by this newspaper. This case justifies this newspaper’s publication of its hazing story – even if it does not provide a defence if this newspaper or its journalists were to be faced with sanctions for the means by which they came by the story in the first place. My colleagues set the scene by introducing this newspaper’s note to readers, published on Tuesday, outlining the reporting methods used in the story. The note, they said, concludes that standing precedent in the Irish courts, such as the Cogley vs RTÉ case, protects the rights of journalists to conduct such a recording when the matter is in the public interest. My colleagues then analyse the Cogley case, in which the operators of a nursing home failed to obtain an injunction to prevent the broadcast by RTÉ of a Prime Time documentary, which included footage secretly filmed inside a nursing home by an RTÉ reporter. They conclude that the judgment “means that the courts won’t grant a temporary order restraining publication where there is a sufficiently weighty interest in publication to justify any interference in legal and constitutional rights. No more, no less”. I agree that this is exactly what the Cogley case says. But that is more than enough for this newspaper. It means that, if there is a sufficiently weighty public interest, then it was entitled to publish the hazing story. As the Press Council Code of Conduct explains, while the right to privacy is an important human right, “it should not prevent publication of matters … in the public interest”. The question addressed by the Cogley case is whether and when publication can be justified in the public interest, even where the information is obtained in breach of privacy. But, in such cases, there is a second question, which is whether – even if the publication is justifiable – the breach of privacy can give rise to other legal consequences. For example, on the facts of the Cogley case itself, even though the public interest justified RTÉ’s broadcast, it would not have precluded other remedies and sanctions. As the judge in the case acknowledged – and as my colleagues point out in their op-ed in Trinity News – the plaintiffs in the case could have sought damages for the alleged breach of their privacy rights. Again, if the Gardaí had investigated whether RTÉ’s recordings had constituted criminal offences, and if, on foot of a report from the Gardaí, the Director of Public Prosecutions had decided to prosecute, then the public interest in the broadcast would not, in itself, have provided a defence to the criminal prosecution. This is not to say that RTÉ might not successfully have defended a claim for damages or a criminal prosecution, only that the public interest in the broadcast would not, of itself, have provided a defence in these actions. Hence, here, even if the public interest justifies this newspaper’s publication of the hazing story, if the Junior Dean investigates the circumstances and decides that the means by which the journalists came by the story breach College rules, then the public interest in the publication would not, of itself, provide this newspaper with a defence before the Junior Dean. The point is that Cogley demonstrates that a sufficiently strong public interest can justify the publication of information obtained in breach of privacy. To that extent, this newspaper is perfectly entitled to seek to rely on that case, and to argue that the publication of the hazing story is in the public interest. I agree with my colleagues that Cogley justifies no other claims for the public interest. And I therefore agree with them that, to that extent, this newspaper cannot seek to rely on that case for any further public interest claims. However, in not pushing the public interest beyond its boundaries, we must not lose sight of its legitimate role within those boundaries. As Cogley demonstrates, that role is to determine whether the publication of information obtained in breach of privacy can be justified. And that is the proper basis on which this newspaper can rely on Cogley. The issue then becomes one of judgment as to whether the public interest does indeed justify this newspaper’s publication of the hazing story. Journalists are not above the law and, as my colleagues point out, they don’t get to self-certify that their stories are in the public interest. But they do have to make an initial assessment of whether the public interest is likely to justify the publication of a story. And they accept the risk that a court – or a Junior Dean – would subsequently come to a different conclusion. And so, the journalists from this newspaper would of course have been aware that the Junior Dean could sanction them for the means by which they came by the story. But that is the risk they took, believing it to be in the public interest. In its note to its readers, this newspaper explained the circumstances of how the Knights’ hazing story came about, and why it thought that publication of the story was in the public interest. 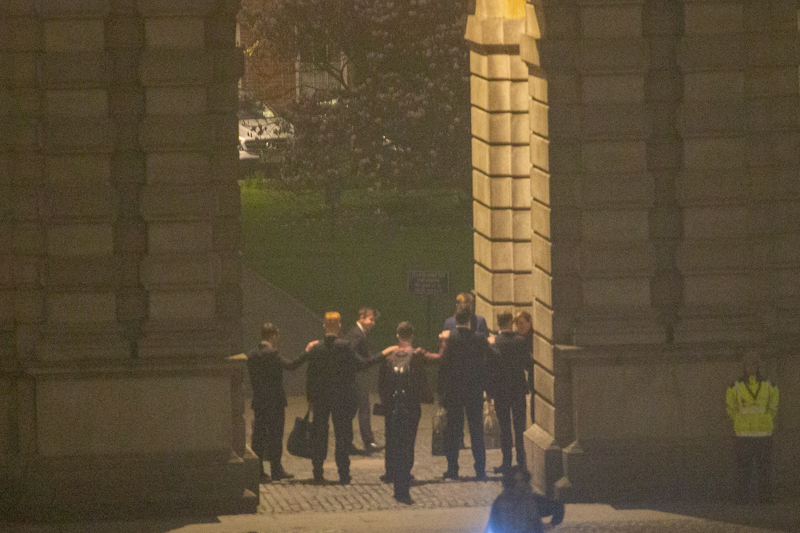 In the context of the earlier story about hazing within Dublin University Boat Club, the information obtained about the Knights’ hazing is of profound importance in College. The earlier Boat Club story was picked up by every major national media outlet, many of which reported that a spokesperson for College said that Trinity “takes matters such as these very seriously and absolutely condemns such practices”. It is in the nature of such rituals that they are conducted away from public scrutiny and often in secret, so the only methods of obtaining such information must be surreptitious. This newspaper and its journalists have been more than willing to disclose the nature of the reporting and the explanations for it. For all of these reasons, this newspaper and its journalists have acted ethically throughout. Revelation of the Knights’ hazing was clearly in the public interest in College, and the Cogley case clearly justifies its publication. Of course, my colleagues take a different view in their op-ed. While I agree with their analysis of the Cogley case, I think that it is incomplete. It does not sufficiently distinguish between this newspaper’s legitimate claim to rely on the public interest to justify the publication of the hazing story, and claims that the public interest would prevent other sanctions. This all reminds me of the old joke: how many lawyers does it take to change a lightbulb? Four. One to change it, and three to disagree with what the first one is doing. However, in the end, on this issue, my colleagues and I share a great deal of common ground, and agree on many of the applicable legal principles. They have done a great public service for the broader College community in providing some sense of their legal and constitutional protections. Indeed, we agree that the Cogley case acknowledged that the public interest can justify the publication of a story, even if it is obtained in breach of privacy. That being so, in my view this newspaper and its journalists can rely on that case to argue that the publication of the Knights’ hazing story is indeed in the public interest. Prof Eoin O’Dell is a Fellow and Associate Professor of law in Trinity. He advised the Department of Justice on the 2009 Defamation Act and chaired the group that advised the Department of Jobs on the current Copyright Bill, and is a member of the Government Data Forum.